Rent Chaos Electronic Arcade Game - a 4 player version of Strike The Lights - Challenge up to 3 friends to see who has the fastest hand / best hand-eye coordination! Perfect for your next Pub Night, Company Party, School Event, or Birthday Party entertainment. Call 301-738-9500 for booking information. 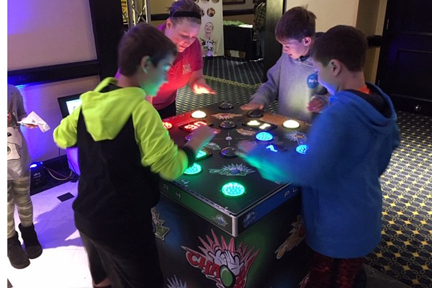 Chaos Arcade Game Table - A 4 player version of our popular Strike A Light game, with the twist of the lights changing color. Each player tries to hit the lights corresponding to their color, which move around the board, creating chaos. But if a button is hit that is not lthe right color,, points are lost. This fast paced, fun game will keep you coming back again and again to try to improve your score. Includes: Electronic game board and 1 attendant. Requires: Electricity (110 volt, 11 amps). Great for ages 6 & up! Other related Game Room party rentals include: Billiards, Table Tennis (Ping Pong), Table Shuffleboard, Pub Style Darts, Foosball, Dome Kick Soccer, Bumper Pool, and more! Throw in a Popcorn Machine, Hotdogs, Frozen Drink Machine, and Nachos, and your party is all set!